History: Our conductor from July 2016 to December 2017 was Arthur Zorn and our accompanist was Mary Jane Austin. As of July 22, 2016 Arthur replaced Mary Bonhag who replaced Piero Bonamico, conductor of the Mad River Chorale for 19 years after taking over from founding conductor Danica Buckley. Mary Jane Austin has been with us for many of the seasons over that same period of time. Previous accompanists include Alison Cerutti, Timothy Guiles, Arthur Zorn and Joan Foster. As of January 1, 2018, we welcomed Mary Jane Austin as our conductor and Alison Cerutti as our accompanist both for rehearsals and performances. Alison Bruce Cerutti (Accompanist) has performed as soloist and chamber musician throughout Vermont, and as a flute accompanist in the U.S. and France. For eight years, she studied with Louis Moyse and accompanied his flute master classes in Vermont and France, and in 2012 performed with his former students in St. Amour, France. Cerutti has played with TURNmusic for the 2015 production of A Fleeting Animal, Arioso, the Northern Third Piano Quartet, the Cerutti-Reid Duo, Veritas, and the Bruce Klavier Duo; and appeared as a soloist with the Burlington Civic Symphony Orchestra and the Vermont Philharmonic. She has premiered works by Vermont composers Lydia Busler, Erik Nielsen, David Gunn, Dennis Bathory-Kitsz, and Jacob Morton-Black. A Vermont native, she studied with Sylvia Parker and earned degrees from Oberlin Conservatory and the Hartt School. 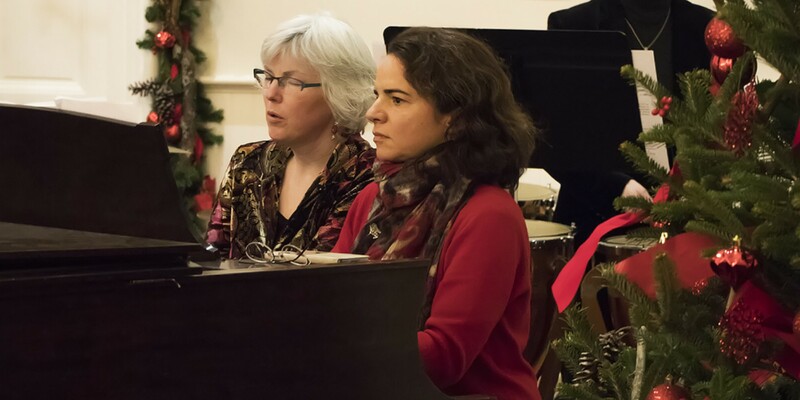 She maintains an active piano studio and is an adjunct professor at Norwich University. Arthur B. Zorn, Barre, is the organist and choir director, Bethany Church UCC in Montpelier. He is a frequent vocal soloist and organ recitalist in Central Vermont. In 2008, after 30 years, he retired from being Chairman of the Fine Arts Department and teaching Choral Music, Music History and Music Theory at Spaulding High School in Barre. Currently his abstract artwork has received critical and commercial success. His website is artzorn.com. Mary was our conductor from 2014 to 2016, having prior experience with many of the MRC singers when she directed the Warren United Church Choir. After training at Michigan and Bard College, her lovely and charming soprano voice has been heard solo at Carnegie Hall, and other significant invited venues. Her performances in various chamber and other settings have received the highest accolades. Her current information may be found at ScragMountainMusic.org She currently lives with her young family in Marshfield, Vermont where she is the artistic director of Scrag Mountain Music, an innovative chamber music series with her husband double bassist/composer Evan Premo. Our Spring 2016 concert “Songs My Mother Taught Me” was her fourth resounding MRC success. Piero was our conductor from 1995 to 2014. His current biography and additional information on his programs can be found on his website. Piero also served as chorusmaster for several seasons of the Green Mountain Opera Festival, providing a professional level of opportunity to a number of MRC singers. He has recently earned the master’s degree in vocal pedagogy at Shenandoah University and currently lives in Washington, DC, where he has opened his own voice studio. Robert De Cormier “retired” to Vermont, but Piero Bonamico helped him start his Counterpoint professional choral group under the Mad River Chorale umbrella. It is now fully independent. DeCormier was well-known in serious choral music history as a conductor and arranger, and known to the general public as the arranger for Harry Belafonte and Peter Paul and Mary. He coached several Mad River Chorale concerts when we performed his work.